England delivered the "good hiding" of Italy demanded by Eddie Jones to leave the Stadio Olimpico with a 40-9 victory that keeps alive their Grand Slam quest. 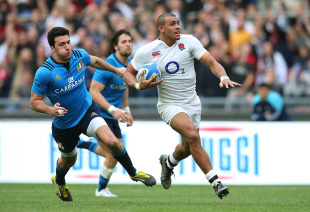 Jonathan Joseph plundered a hat trick of tries in a final half-hour that was dominated by the Red Rose, while George Ford and Owen Farrell also crossed on an afternoon that saw the Azzurri suffer a late collapse. Until Joseph struck for the first time in the 53rd minute, the "absolutely brutal" demolition in which no Italian was "left standing" sought by Jones looked a bold ambition with the lead a slender 11-9. Italy's intent to play was evident until they eventually folded and in Carlo Canna they had a fly-half who could challenge the line and force openings, but the killer instinct to put away chances is still missing. Most of the earlier attacking highlights were provided by Sergio Parisse's men, who were often the more creative, but England eventually moved through the gears to capitalise on an increasingly ragged defence. Maro Itoje made his eagerly-awaited debut off the bench, but it was the lightning-fast Joseph who stole the show, even if Ben Youngs was named man of the match by the Italian host broadcasters. Joseph was exposed twice during a torrid start, however, after being flattened by opposite number Michele Campagnaro and then conceding a turnover. Three points from the boot of Canna saw the Azzurri rewarded for their endeavour, but when their scrum crumbled deep in their own half Farrell was able to level the score. A dummy and break by Youngs saw England renew their attack with Dylan Hartley, Courtney Lawes and Billy Vunipola adding weight to the assault until a knock-on brought the move to an attack. Farrell departed for a head injury assessment after being flattened by a heavy tackle -- he later returned -- so it was Ford and Canna who exchanged kicks as a tight opening quarter drew to a close. There was redemption for Joseph as his tenacity in pressing defence helped England win a turnover that was threaded left where a crafty pass from Vunipola found Farrell and Ford darted over in the corner. Italy were full of ambition but a promising move broke down once more, allowing Anthony Watson to counter-attack with a timely injection of pace. Canna kicked his third penalty and the Azzurri finished the half with a flourish, forcing Chris Robshaw and Jack Nowell to save the day by scrambling back in defence. 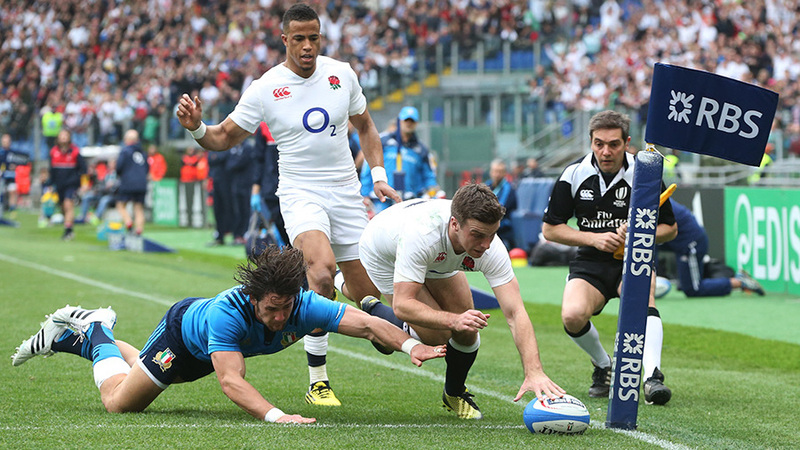 England were struggling to match Italy's intensity and it was the home side who were in the ascendancy as an ugly third quarter unfolded, so when a second try was plundered it came against the run of play. Italy were looking to counter from their own 22 and wing Leonardo Sarto paid the price for a desperate pass that was easily picked off by Joseph, who crossed under the posts. Five minutes later Joseph crossed again, collecting a brilliantly judged grubber by Danny Care and strolling over the whitewash. The hat trick was completed with a show of strength from Joseph, who rode several tackles before crashing over with Joe Launchbury prominently involved in the build-up, before Farrell arrived to deliver the final blow.